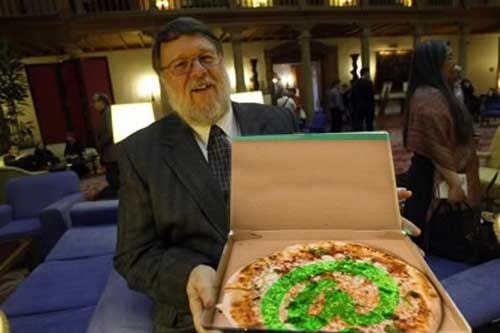 Each time you send an email, and perhaps by extension of the convention, you should thank Ray Tomlinson and his inspiration, @rmando’s Pizza Shop in Cambridge, MA. Tomlinson, a graduate of MIT, started work as a programmer in the mid 1960s at Bolt, Beranek and Newman, the firm working with ARPANET to develop the first computer network that evolved into the Internet we know today. The concept of computer messaging had been around a while, but was limited to people sending messages only to other people using the same computer. The program was called SNDMSG, and Tomlinsons idea was to improve it be able to send messages to other nodes on the network BBN was connecting. it really was my signature! Tomlinson envisioned a network of computers at the pizza shop, and the ability to order pies via network messaging. According to the history, email was not even something the ARPANET directors did not ask for. Why did he create it? Mostly because it seemed like a neat idea. There was no directive to “go forth and create email”. The ARPANET was a solution looking for a problem. A colleague suggested to my boss I not tell him what I had done because email wasn’t in our statement of work. This is my contribution for the brilliant Patty Pioneers meme/assignment triggered by Scott Lockmans class in Tokyo. The photo of Tomlinson was found on Photobucket, and the shape of the computer he is holding immediately suggested to me– PIZZA! I found a photo of a pizza box from All Things Pizza. In PhotoShop, I used the polygon selection tool to trace the shape of the laptop, and used Edit-Paste Special to insert the pizza in place of the laptop. I had to use Edit-Transform-Distort to shape the box, after deleting the white background. It did not quite work, so I lined up the hinge of the pizza box to that of the computer. I selected the top half of the box, and did option-shift to copy the box top and fill the top half. A bit if magic brush smoothed out the seam. Finally, using the text tool (Marker Felt font) I added the @ sign, using the Vivid Light style on the layer, dropping opacity to 67%. This assigment makes me hungry for more Patties! I’m starting to really appreciate this assignment as it slips from the absurd to the sublime. I didn’t even know about Ray Tomlinson and a couple of the other patty pioneers. Wait a minute! I’m learning some history here! That’s sneaky! And I love it. I didn’t even realize the pizza he was holding was a “fake” until you started describing what you had to done to manipulate the image, bravo!